Working as MCN’s British Superbike reporter takes me here, there and everywhere. Not only do I get to head out to 12 rural destinations in far-flung corners of the UK (and the Netherlands), I’m often out and about in the week visiting racers. of my annual mileage, on top of my 136-mile round-trip commute to our Peterborough office. So, it’s simple; I need a workhorse, something that’ll chew up the miles, carry a decent amount of luggage and doesn’t mind being parked up in a wet, muddy field while it’s inevitably raining at Oulton Park. I carry a lot of stuff to BSB meets. Not only do I have my work uniform for each day but a change of clothes for the evenings and a rucksack full of the paraphernalia needed to do my job. I’m away for four nights, from Thursday to Monday and if I go in the car I’ll take a medium-sized suitcase, a rucksack and a bag of MCNs. It’s easy. Fitting it all on the V-Strom, however, is a little more challenging. four days’ worth of work uniform and clothes as well as all my kit in. One MCN Alpinestars jacket and a pair of shoes and the exhaust-side pannier is full. While you can fit a bit more into the topbox and left-hand pannier, it’s still not enough. I ended up having to put most of my clothes into a roll bag and attach it to the rear seat and use a rucksack for work kit. Aside from having to spread my luggage out, the V-Strom handles work trips well. The 20-litre tank and decent fuel economy mean I’m not filling up every five minutes and the upright seating position and wide bars make for a comfortable ride on motorways and A-roads. The big screen, handguards and aerodynamic front-end also protect me from the weather. 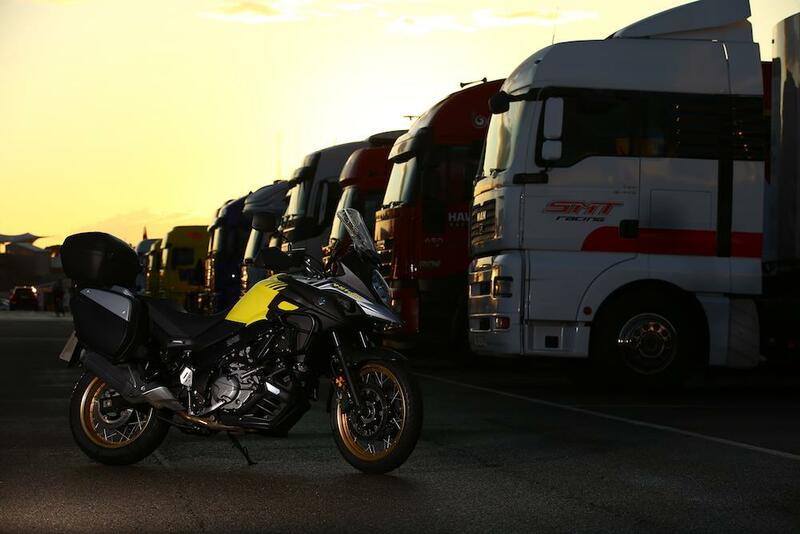 Ultimately, the V-Strom is an ideal workhorse. It’s not a gas guzzler, it’s comfortable and while I might moan about luggage space, I could still have taken a lot more with me if I’d really wanted or needed to.